Due to its high-abrasion resistance and impermeability to water and chlorides UHPC is an ideal material for long-lasting bridge deck overlays. 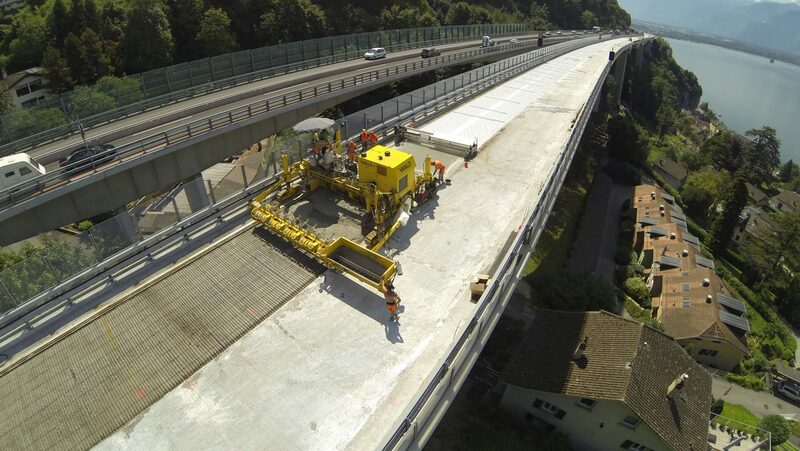 It can rehabilitate and strengthen deficient bridge decks thus minimizing future service and rehabilitation costs. Our mechanized application method using a UHPC paver offers a very cost-efficient and fast installation method with superior surface finishing to manual placing methods. The basic concept is to use UHPC in the zones of a concrete structure where outstanding UHPC properties in terms of durability and strength are most exploited. UHPC is thus used to strengthen the structure where it is exposed to severe environmental conditions like de-icing salts or marine environment, etc. and high mechanical loading such as concentrated forces, fatigue, abrasion or impact (Brühwiler, 2015). This concept is applicable both to improve and strengthen existing structures and to build new robust and durable structures. It is well suited for bridge decks or slabs and parking decks as well as buildings, galleries, tunnels and retaining walls.